The Long Trail lends itself to section hiking, as there are multiple road crossings near towns with transportation and other services. 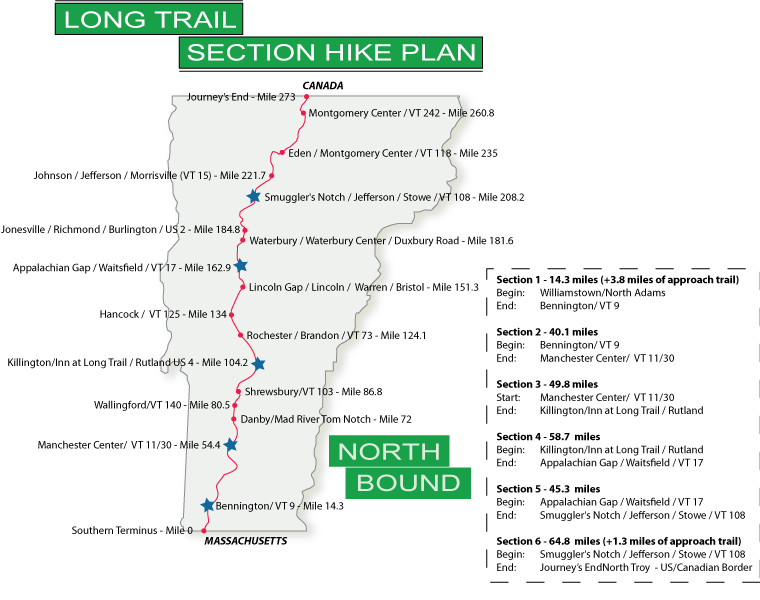 Shown below is one suggestion for section hiking the Long Trail. Of course, you can do these sections in whatever order or direction you choose. For sections that are not serviced by public transportation (northern sections in particular), one can make use of shuttle services. Please check out the To And From The Trail section of the website. Both the northern terminus and the southern terminus are not accessible by car (the precise ends of the trail are in the middle of the woods), therefore you need to take an approach trail to either end. The approach trails are not long. Route 2 (Williamstown/North Adams, MA) to Route 9 (Bennington) – This section is 18.1 miles long (Using the Appalachian Trail as your approach trail – 14.3 miles of Long Trail + 3.8 miles of approach trail). You can park at at Williamstown Motel ($2/day) or at the Greylock Community Center (no fee) along Route 2. Once you reach Bennington, you can take the Green Mountain Express Bus (Purple Line) back to Williamstown for just $1/person. Route 9 (Bennington) to Route 30/11 (Manchester Center) – This section is 40.1 miles long. You can park your car at the Green Mountain House in Manchester Center (no fee) and hike to Route 9. Once your reach Bennington, you can take the Green Mountain Express Bus back to Manchester Center for just $2/person. Route 30/11 (Manchester Center) to Route 4 (Killington) – This section is 49.8 miles long. You can park your car at the Green Mountain House in Manchester Center (no fee) and hike to Route 4. Once you reach Killington, you can take The Bus (Diamond Express) to Rutland for just $2/person and then take the Green Mountain Express (Orange Line) back to Manchester Center for another $2/person. Route 4 (Killington) to Route 17 (Waitsfield) – This section is 58.7 miles long. You would need to have two cars for this section, hitchhike, or hire a shuttle service to bring you back to your car at the end of your hike, as there is no public transportation between these two towns. Route 17 (Waitsfield) to Route 108 (Stowe) – This section is 45.3 miles long. You would need to have two cars for this section, hitchhike, or hire a shuttle service to bring you back to your car at the end of your hike, as there is no public transportation between these two towns. Route 108 (Stowe) to Journey’s End – This section is 66.1 miles long (64.8 miles of Long Trail and 1.3 miles of approach trail). Because of the rural nature of this part of Vermont, it is not really possible to shorten this final stretch, unless you took side trails to get off the trail earlier. You would need to have two cars for this section, hitchhike, or hire a shuttle service to bring you back to your car at the end of your hike, as there is no public transportation between these two towns.